Ok, I came across this on interest a few months ago and I couldn’t stop laughing. 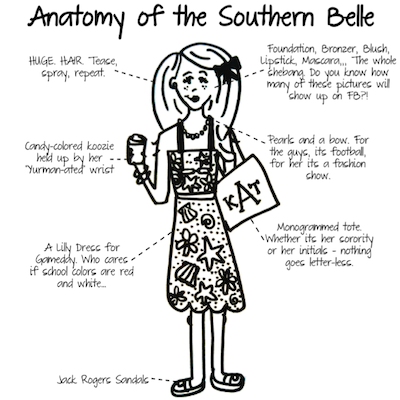 A visual diagram: the anatomy of a southern belle! Hair- I disagree that it is all big and teased. Maybe in Texas, not everywhere else int he South. While there are people who do this, I think there are even more out there that like their flat irons. How else do you even begin to manage the humidity!? Koozie- Yes. Usually from some past event or a location.I have plenty. Lilly Dress- Yes. Not so sure about the Gameday… lots of people go for the school colors. But Lilly dressed definitely are a part of the wardrobe. Personally, I love me some Lilly. Jack Rogers- Yes. Love them, want to get a pair but I haven’t bit the bullet. Makeup- Yes. I should be clear… I generally don’t go out without makeup… unless it is to a drive-through window or an emergency. If pictures will be taken… there is a full face of makeup. Pearls- Yes. Got my first set at 16. Love them. The monogrammed bag- Yes. But mine is a makeup bag and it is my initials. I have four names, makes it hard to put a monogram on it! The only thing that I would add to this is sunglasses being held up by croakies. Otherwise this is a pretty good rendition of a southern belle*! *At least in the warmer months! This changes when weather is cooler!